Sift flour, baking powder, chilli powder, salt and pepper in a bowl. Lightly whisk eggs and Obento Sushi seasoning together. Make a well in the centre of the flour mixture, add eggs and seasoning; stir until smooth batter forms. Add cabbage, shallots, daikon and carrot. Stir to combine. Heat oil in a large frypan over medium heat. Working in batches, drop ⅓ cup of batter into the pan and cook for 3-5 mins each side or until golden and cooked through. 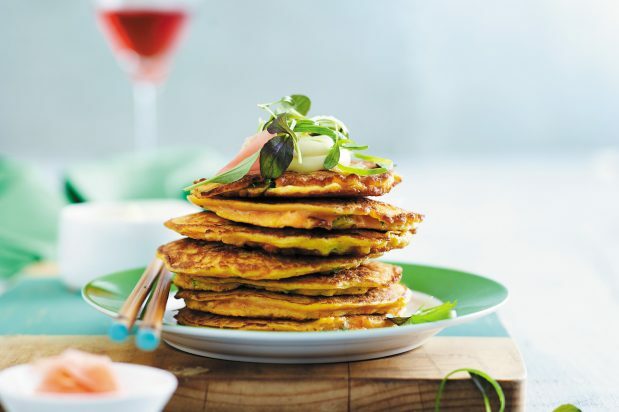 Top each pancake with strips of Kewpie Mayonnaise, micro herbs and serve with Obento Pickled Ginger.